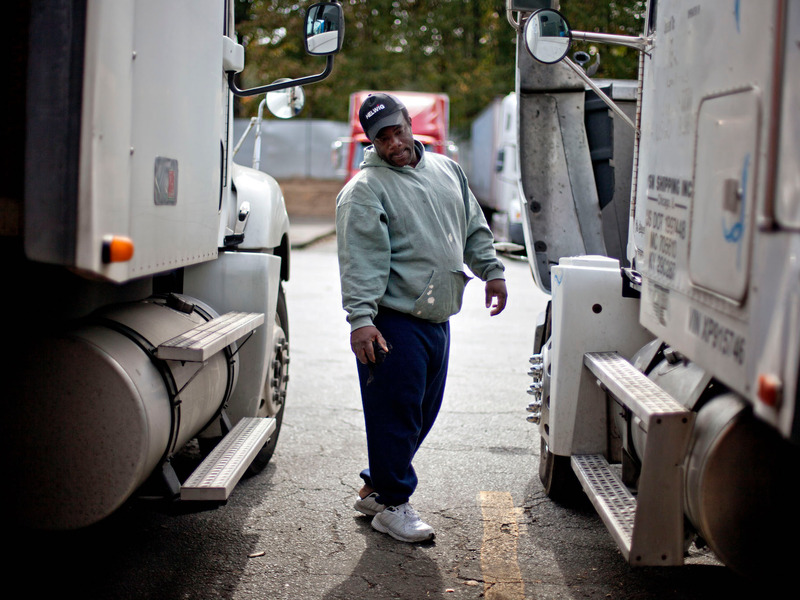 Truck drivers are typically paid per mile, rather than per hour. That means much of the time they spend on the road often goes uncompensated. A class-action lawsuit in Arkansas of nearly 3,000 truck drivers argues that the practice goes against the Fair Labor Standards Act. He also certified the case as a class action suit that can be tried under Arkansas law, which means more PAM employees can join the case. America’s 1.8 million long-haul truck drivers spend weeks away from home — sleeping, eating, and working in their truck. They’re legally capped at working 70 hours for an eight-day period, but rarely receive overtime. But some of that time on the road isn’t paid. Truckers are usually paid per mile, not per hour. A federal judge in Arkansas has argued that this violates Fair Labor Standards Act. On Friday, District Judge Timothy Brooks reaffirmed that PAM Transport violated federal labor laws when they didn’t pay their truck driver employees at least minimum wage for every non-sleeping hour spent in their truck. In October 2018, Brooks made waves in the trucking community when he ruled that PAM Transport would have to pay their truckers at least minimum wage for 16 hours each day that they work. There are 3,000 truck drivers in the class action suit against PAM. It’s an about-face in an industry where truck drivers regularly spend hours waiting for shipments at warehouses, and often aren’t paid for waiting. Indeed, the federal government ruled that truck drivers should not get paid for their rest breaks. Brooks also widened the scope of the lawsuit to be a class action suit that can be tried under Arkansas law. Justin Swidler, the attorney representing the truck drivers in the PAM case, told Business Insider that’s significant as Arkansas state laws have stronger labor laws than the federal government. „It greatly enlarges the number of people who can benefit,“ Swidler told Business Insider. „We are very disappointed with the Court’s ruling and respectfully disagree with the Court’s holdings,“ Clark wrote. „We plan to vigorously fight this, including review of the Court’s decision. Swidler agreed. „These carriers have to really start paying attention to minimum wage,“ Swidler told Business Insider. In December 2018, a group of approximately 10,000 truck drivers referred to Brooks‘ ruling as they argued that their employer Swift Transport, which is the sixth-largest trucker in the country, violated labor laws by not paying for their training orientation. That idea also points to other recent court cases in favor of truck drivers securing pay for every hour they spend on the road. In 2017, a Nebraska court decided that trucking giant Werner Enterprises must pay $780,000 to 52,000 student truck drivers for alleged pay practice violations. Another major carrier, C.R. England, paid $2.35 million in back wages to more than 6,000 drivers in 2016.